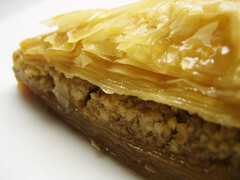 Baklava is a sweet pastry made of layers of Filo dough filled with chopped nuts and bathed in a sweet syrup. It is labeled as a Turkish, Greek or any of a variety of Middle Eastern countries’ delicacy. My family made it on the Island of Rhodes, so I claim it as my own.